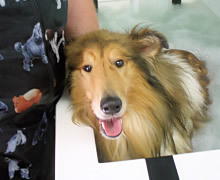 A well planned course of hydrotherapy treatment encourages joint movement in non-weight bearing conditions, improving muscle tone, promoting tendon repair without imposing undue stress on damaged tissues and improving cardiovascular stamina. Almost every muscle of the anatomy is exercised whilst avoiding impact to joints and bones. 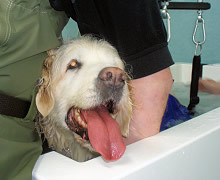 Hydrotherapy can be used for the treatment and rehabilitation of Arthritis, orthopaedic conditions, muscle, ligament and many other types of injury. It can also help with general convalescence, obesity and fitness training. It is ideal for building muscle both prior to an operation and after the stitches have been removed and skin healed. Where walking is too painful and strenuous, hydrotherapy swimming allows the "working out" and strengthening of muscles while avoiding potentially damaging concussion shocks of footfalls on hard surfaces. While these stresses are necessary to maintain healthy, strong bone, if severe, or repetitive, the shock waves can actually damage or weaken limbs, particularly an arthritic joint or one recovering from an injury or surgery. Hydrostatic pressure applied by the water assists in reducing swelling by causing excess body fluid movement away from the affected area. This is enhanced when exercising the limb to enhance circulation. Pressure on the chest makes breathing more difficult, Spa resulting in the lungs and heart working harder. This leads to an improvement to the respiratory and cardio-vascular system. If all this sounds like hard work - it is - that's the idea! 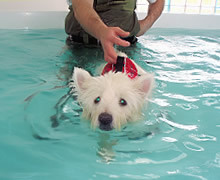 For a dog, a 5 minute structured swim program is equivalent to about a 5 mile run, but the natural buoyancy of the water and the protection from sudden twists and falls makes hydrotherapy a safe and effective and enjoyable form of exercise. 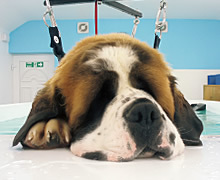 Most Pet Insurance Companies now cover this type of rehabilitation treatment - check your policy for details.